Ms. Cupcake » Check Out Our Halloween Menu! Ms. Cupcake > News > Cupcake News > Check Out Our Halloween Menu! Check Out Our Halloween Menu! 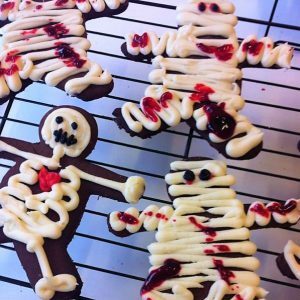 Here at Ms. Cupcake, we LOVE Halloween! Getting dressed up and eating loads of candy… what’s not to love?! So we’re getting fully in to the spirit with our baked goods too! 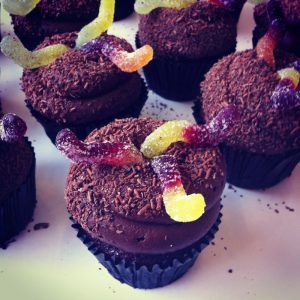 We’ve got loads of gruesome cupcakes at the shop including Dirt and Worms, Raspberry Ripper, Tarantulas and more. 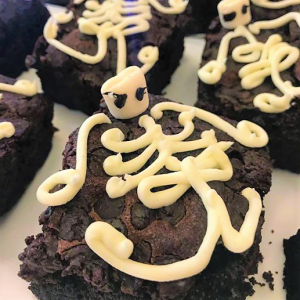 Or how about our Scary Skeleton and Mummy Cookies or Spooky Brownies? We’ll have these treats in store (along with loads more) until 31st October, so head down and stock up for all your Halloween parties! 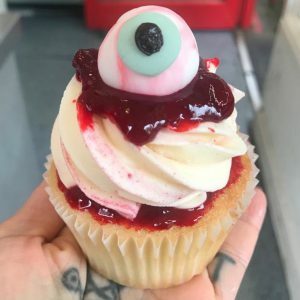 This entry was posted on Friday, October 26th, 2018 at 11:04 am and is filed under Cupcake News. You can follow any responses to this entry through the RSS 2.0 feed. Both comments and pings are currently closed.